Here are the projects in competition, choose wisely and vote! French customers are savvy for African-inspired products and craftsmanship. Through DOZA, we want to bring a curated selection of beautiful creations from South Africa directly to them. To do so, DOZA.CO uses a crowdsourcing model and is in line with collaborative economics. Through DOZA, we wanted to create new consumption habits and a new way to purchase goods on the Internet. enable the birth and growth of start-ups that can positively impact people’s lives. 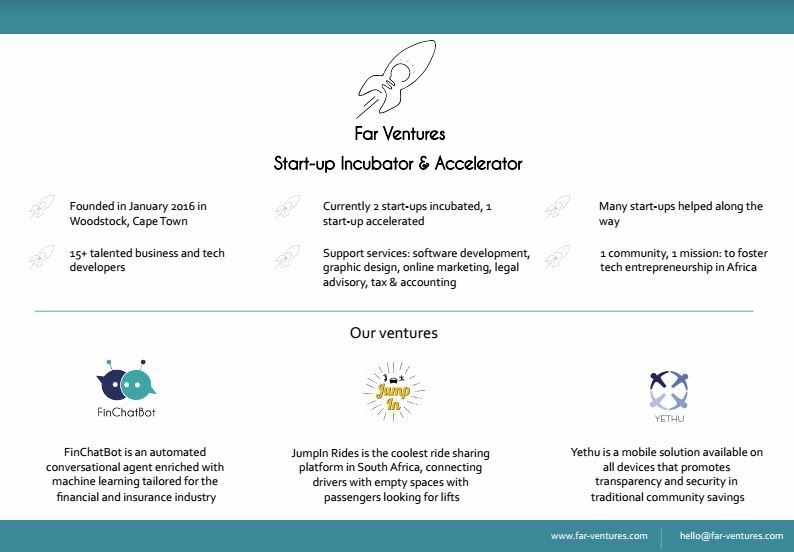 Far Ventures is a Start-up Incubator & Accelerator based in Cape Town. financial industry, and JumpIn Rides, a ride sharing platform. bringing transparency to community savings schemes. Stokvella Yethu is a mobile solution available on all devices that promotes transparency and security in traditional community savings. our drive to bring a positive change to our world. Founded in June 2016, FinChatBot is a South African Start-up developing chatbots to disrupt the financial industry. Our potential clients range from banks, debt counselling institutions along with insurance and credit providers. But what is a chatbot? A chatbot is a conversational agent powered by rules and Artificial Intelligence that users interact with via a chat interface. It’s an exciting innovation offer an infinite spectrum of possibilities! Ikhaya Mossy is a social enterprise born in Cape Town , South Africa. The fruit of a meeting between a French lady called Aminata NDIAYE, and South African artists; Ikhaya finds its origin in the Xhosa (South African tongue) and Mossy in the munukutuba (Congolese tongue) and means the Unique House. Jump In Rides is a fast growing start-up part of Far Ventures (http://www.far-ventures.com/), a start-up incubator and accelerator based in Cape Town. As a result of a long-term consulting study sizing a huge opportunity in the South African transport eco-system, we launched an online carpool and ride share service in July 2016. First and foremost, our studies brought out several points among which a striking lack in the offer regarding middle-todistance trips in South Africa. Besides, the geographical and urban repartition in South Africa as well as local infrastructures showed maturity and efficiency towards automotive transport. Then, our reflexion was based on the observation that on the one hand most of the drivers have spare seats and on the other hand, many people struggle finding a way to travel cheap. Last Mile for BoP is a social business based in Cape Town and focused on improving the distribution of affordable and quality products and services in underserved townships and rural areas in South Africa.Our mobile application enables informal grocery store owners (spaza shops) to compare bulk prices at wholesalers and order all their stock price directly from their phone.We partner with independent local owner-drivers to deliver their order from the wholesale stores to their doorstep within a few hours. LeCoquin is a unique Dairy Free company working from coconut milk and french cooking method designed to help people eat much better without changing their habits. We have created a coconut milk based yoghurt that do not contain naturaly any lactose, added chemicals or anything related to animals. The way we make is a summary of the places I had the chance to experience and inspiration of family recipes from the 1920s. We can now all share food no matter what our dietary requirements are . Africa offers a world of opportunities in a wide range of countries, with different legal systems, and a multitude of languages and ways of doing business, which may appear challenging to deal with at first.Our aim is to bridge this gap by supporting international clients in regards of their operations in Africa. In parallel, we also help South African companies increase their African footprints.We are a one-stop consulting firm in the fields of legal, regulatory and tax analysis, with a special focus on multi-jurisdictional projects or cross-border transactions. We offer fast and reliable service for your business in English, French, German, Spanish or Afrikaans. After launching her first jewellery brand in Paris, Morgane began exploring new and different horizons in South Africa. Under the name Morgane&TheQueen, she enjoys combining her European culture with the raw, geometric design and distinctly unique African art forms.Using traditional jewellery techniques, she handcrafts silver jewellery from her studio situated in Woodstock. Tutorfy is a curated online marketplace that connects students in primary school, high school and university with vetted and trained home tutors in their area. Yethu is an innovative ground-up solution that aims to tackle problems experienced by the 11 million South Africans involved in stokvels. Stokvels have been created out of necessity because the majority of south Africans are excluded from the traditional banking system. Stokvels are completely based on trust and this creates loopholes for fraud and theft. 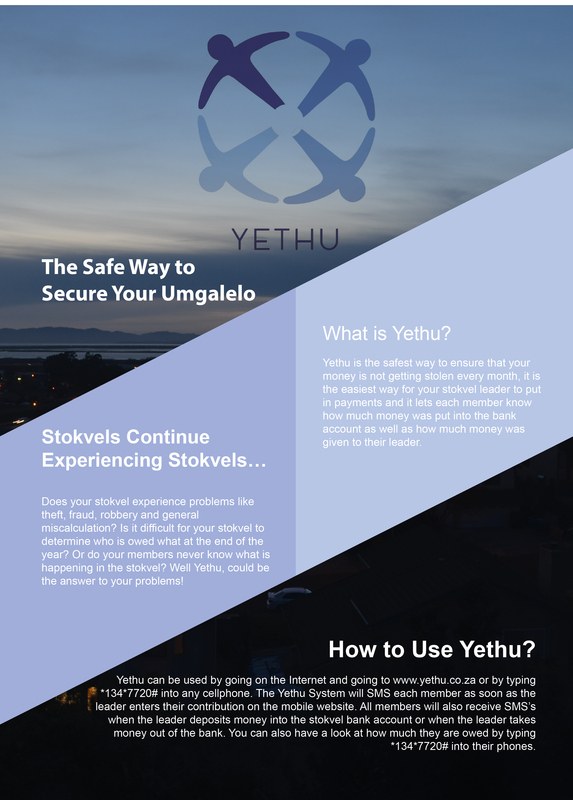 Yethu aims to give stokvel members the security, transparency and accountability that have not previously existed as well as giving the leader a management tool that allows them to be more accurate, gain more interest and increase their trust in their stokvel.